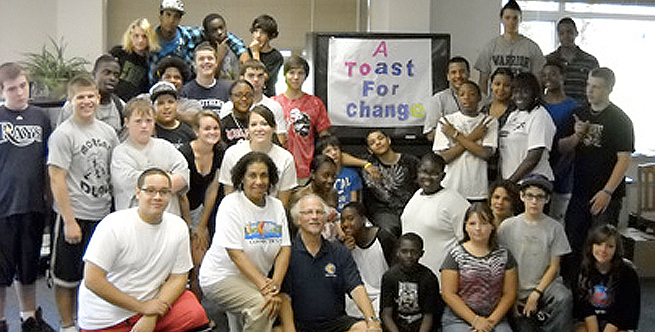 Dr. Blumenkrantz and Center staff join in "A Toast for Change" with 7th and 8th grade students, teachers and mentors from Middletown Public Schools as part of the ROPE® Initiation of Scholars program during the summer of 2010. The cries of young children brought these groups together on the banks of a swiftly running river. All stood gasping at the site of a child caught in the current and plunging over a waterfall. Youth development involves connecting and enhancing environments and building competencies, which promote the positive development of children and youth in their families, in their schools, among their peers in their community and with a strong connection to the natural world. For the "bigger picture", click HERE. You can’t do it alone – You can be a catalyst for making connections and hosting conversations about community-oriented rites of passage as a framework to unify all education and youth development practices. Youth & community development through rites of passage is a whole systems approach to education and youth development that recognizes and puts into practice the view that everything is connected and related. A community’s rite of passage story emerges through civic engagement that builds “social capital,” which is what results when people work together to resolve common issues. Like threads in a tapestry language weaves a common story that links techniques for clinical practice in prevention with identification, treatment and maintenance. Community leader(s) Citizens, education, civic and government – more the better – who understands a whole system’s orientation, sees connections and patterns, open to or understands rites of passage, especially direct experience and vision for exploring and adopting a new paradigm for education, youth & community development. How do you know? Capacity for collaboration among school, community, and families and a commitment on their part to take strength-based approaches seriously and move beyond one problem, single solution orientation. Find out more, click HERE for Youth Development Specialists.